Immune blistering diseases may involve the cutaneous or mucosal surfaces of the female genital structures. Blisters that form on mucosal surfaces erode quickly and appear more commonly as erosions. Diagnosis requires a thorough history and full examination of all cutaneous and mucosal sites to identify lesions that may be asymptomatic, healing, or hidden from view. Histology and direct immunofluorescence of a biopsy taken from the edge of a blister or erosion are necessary to diagnose and differentiate these diseases. An important characteristic is the location of blister formation: subepidermal or intraepidermal. Management principles and recommended medications overlap for many of the immune blistering diseases; where specific differences exist, notations are made with the description of the disease. Systemic steroids or other immune-suppressive medication are often indicated. The use of topical steroids is occasionally sufficient and should be considered for vulvar skin lesions, especially in disease that is otherwise well-controlled. 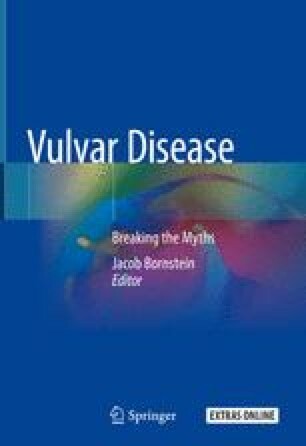 General care of the vulvar skin should include a review of basic guidelines with emphasis on soaks and barriers or skin protectants. Close follow-up and examination of cutaneous and mucosal surfaces are warranted for surveillance as many of these diseases are prone to recur.